4 SDI INPUTS, and 1 ASI INPUT for feeding in local programs/services. DVB-T, DVB-C, ISDB-Tb, or ATSC RF MUXES, IP, and ASI outputs. 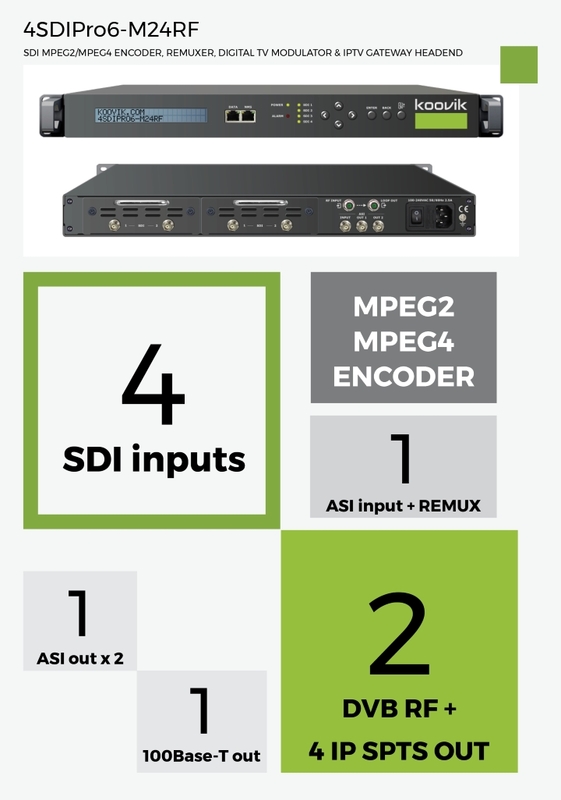 Audio CODEC MPEG1 Layer II, MPEG2-AAC, MPEG4-AAC, *Option: Dolby Digital AC3 (2.0). Add -AC3 to order code. RF 1 x Digital RF OUT (*depends on modulador option). ASI 1 x ASI ( 2 mirrored ASI outputs ). With 4 x SDI TS. BNC 75 Ω female.